You will never go back to just plain cherry tomatoes after you try these. They are great on pastas, bruschetta, cold rice salads or risottos, or a simple accompaniment to fish or chicken dishes. Very easy to prepare, however they do require around an hour on a low setting in the oven. But definitely worth the wait! Slice the tomatoes in half and place them cut side up on a baking paper lined pan. Drizzle with olive oil, sprinkle some salt and crush some pepper on top. Place a little herbs on the tomatoes and sprinkle with a little garlic pepper or powder and chilli (these last two optional). Finally sprinkle the tops with a little brown sugar. Place the sheet in a preheated oven (140C) for about an hour. 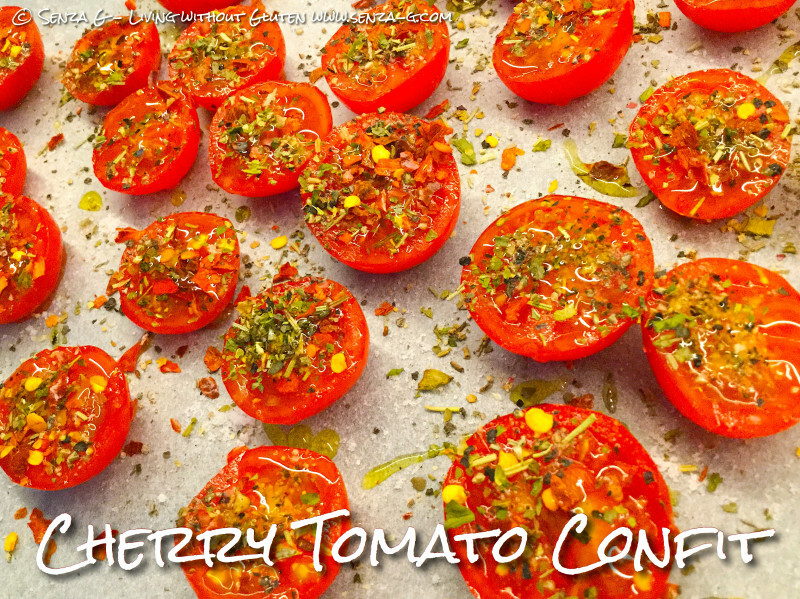 * if you wish you can use fresh herbs instead of dried, sprinkled after the tomatoes are finished roasting.